Did you know that around one third of the heat-loss in your house could be through the walls? If they aren’t well insulated, you could quite literally be paying good money to heat the outside air. Houses built from the mid 1980’s onwards tend to have good insulation, but older homes are often very inefficient. Luckily, if you do live in one of these older properties – as many people in the UK do – there are ways to insulate them and save some money on your heating bill. British houses can generally be put into two categories – cavity wall or solid wall. Cavity wall homes actually have two external walls, with an air-gap of about 50mm in between. This has a similar effect to wearing several layers of clothing on a cold day – the brick ‘layers’ trap air in between them, acting as a thermal insulator. Cavity walls are common in houses built from the 1920’s onwards. Solid walls, as the name suggests, do not have a cavity and are composed of solid brick or stone. Both of these wall types can be treated with insulation in order to prevent heat loss. 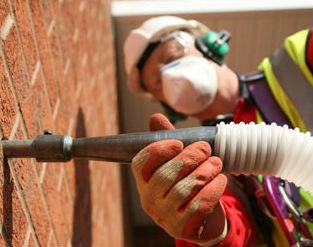 This article focuses on cavity wall insulation. How can you tell if you have cavity walls? You can actually tell by looking at the brick pattern of your outside walls. If each brick looks the same length, then you probably have cavity walls. If on the other hand you can see a pattern consisting of ‘long’ bricks and ‘short’ header bricks, you have solid walls. You can also tell by looking at the thickness of your walls (open the front door or look at the side of a window). If the overall thickness of the wall is over 260mm (10 ½ inches) then it is likely to be a cavity wall. Fitting cavity wall insulation isn’t something that should be attempted by a DIY-er. You should use a reputable company that is approved by CIGA (The Cavity Insulation Guarantee Agency). If the installer doesn’t know what they are doing, all kinds of problems can arise, such as damage to the walls, cold-spots and condensation. You cannot install cavity wall insulation in a house that has problems with damp, or that doesn’t have a damp proof course. There may be funding available to have this dealt with before installing the insulation – check with your energy provider or your local council. Getting cavity wall insulation installed will cost roughly £500, depending of course on the size of your house. Having said that many households are eligible to have it done for free, as part of the government’s goal to reduce the country’s carbon emissions. To find out if you are eligible for a grant, you should contact your local council, your energy provider, or a local insulation company. Sam writes about energy saving, renewable technology and environmental issues. He currently works for Go Greena Ltd a free insulation company based in Manchester.